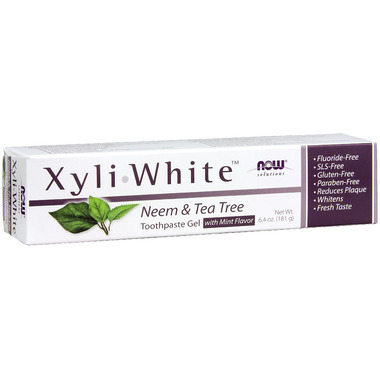 NOW Solutions Xyliwhite Neem & Tea Tree Toothpaste Gel is a remarkable fluoride-free toothpaste gel that uses natural Xylitol as its main ingredient. XyliWhite™ is a remarkable fluoride-free toothpaste gel that uses natural xylitol as its main ingredient. It is formulated with the cleanest ingredients with the goal of promoting healthy teeth that are whiter and stronger. XyliWhite™ contains 25% Xylitol, one of the highest contents available! Directions: Adults and children 2 years and older: Apply XyliWhite™ toothpaste gel on to a soft bristle toothbrush. Brush thoroughly after meals, at least twice a day, or as directed by your dentist. Ingredients: water, xylitol (25%), hydrated silica, glycerin, sorbitol, sodium bicarbonate, calcium carbonate, sodium carbonate, melia azadirachta extract (neem), melaleuca alternifolia (tea tree) leaf oil, gaultheria procumbens (wintergreen) leaf oil, natural mint flavor, papain, xanthan gum, sodium coco-sulfate.